On the water or in the classroom, our community sailing instructors are certified, experienced sailors eager to pass on their years of sailing experience. Mystic Seaport Museum offers a full lineup of sailing programs: Youth, Adult, Family, and Homeschool. You can even test what you’ve learned in a weekly racing series. Learn to sail aboard our famous, prize-winning 62-foot schooner Brilliant as you take the helm, raise the sails, stand watch, and navigate into beautiful New England harbors. As part of the oldest sail education program in the country, Brilliant teaches adults and teens (15-18) traditional nautical skills and other lessons of the sea. Teen sails are scheduled during the summer and adult sails are offered during the spring and fall. Register for a scheduled sail, or charter the boat for your group. 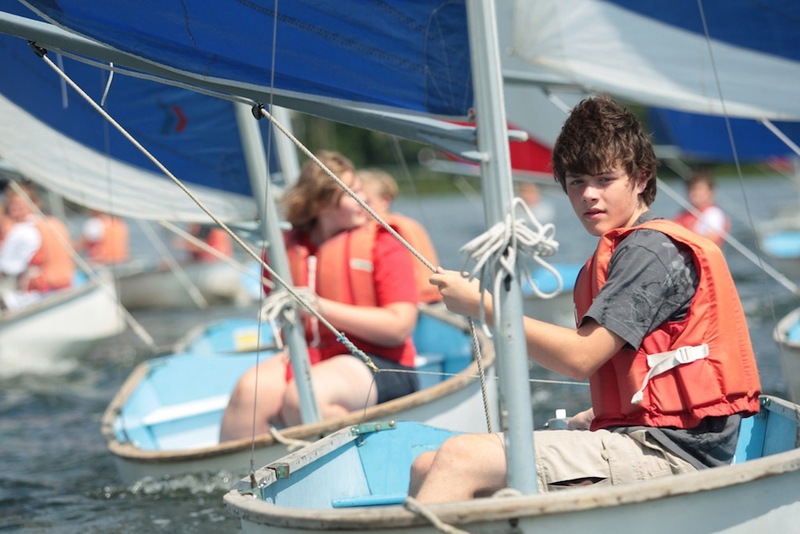 Since 1949, the Joseph Conrad Summer Sailing Camp has been the overnight summer camp of choice for more than 350 campers annually. Living aboard the majestic tall ship, Joseph Conrad, your 10-15 year old will learn the rules of the sea while sailing our fleet of 50 Dyer Dhows. Become part of the crew and reserve a bunk today. The Mariner Training Program at Mystic Seaport Museum began in 1950 with six Dyer Dhows donated from local yacht clubs. Now through the continued generosity of clubs and individuals, The Museum is home to the largest active fleet of 9-foot Dyer Dhows in the world! Used as part of Community Sailing and the Conrad sailing program, thousands have learned to sail and continue to race these Dyers regularly. New scholarship funding available for sailing programs at Mystic Seaport Museum! We are pleased to announce that we have scholarship funding available for our Community Sailing (ages 8-14), Joseph Conrad Overnight Sailing Camp (ages 10-15), and Schooner Brilliant (ages 15-18) summer camps and spring and fall programs. Up to 100% financial aid is available depending upon need. To apply complete the application on this page. For more information contact Catherine Padgett at 860.572.5322, ext. 1, or reservations@mysticseaport.org.